After a few requests, I’ve decided to put together a simple howto for building a home NAS with Opensolaris. Common PC hardware is all you need. 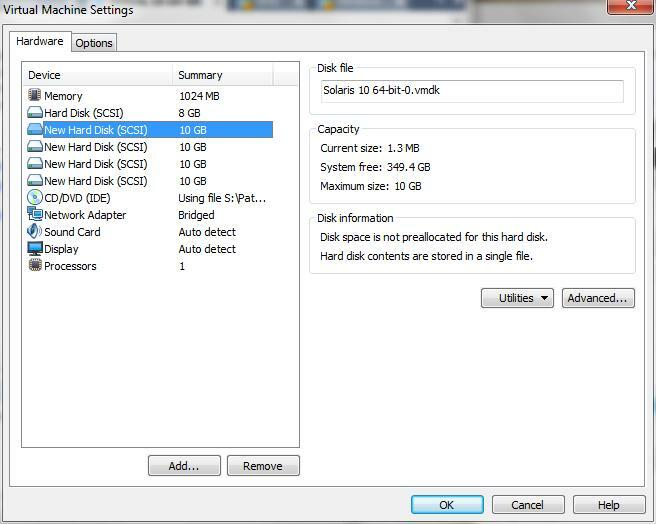 No propriatary disk bay system. Gigabit Ethernet. Well, providing your network card and switch support it. Cheap, redundant disk arrays with ZFS, the Opensolaris RAID-like filesystem. In a nutshell; it’s cheap, it’s easy, and it’s simple. So on the upside you won’t need to spend a great deal of cash to get yourself a nice NAS, but you might miss out on a feature or two. So let’s get started. 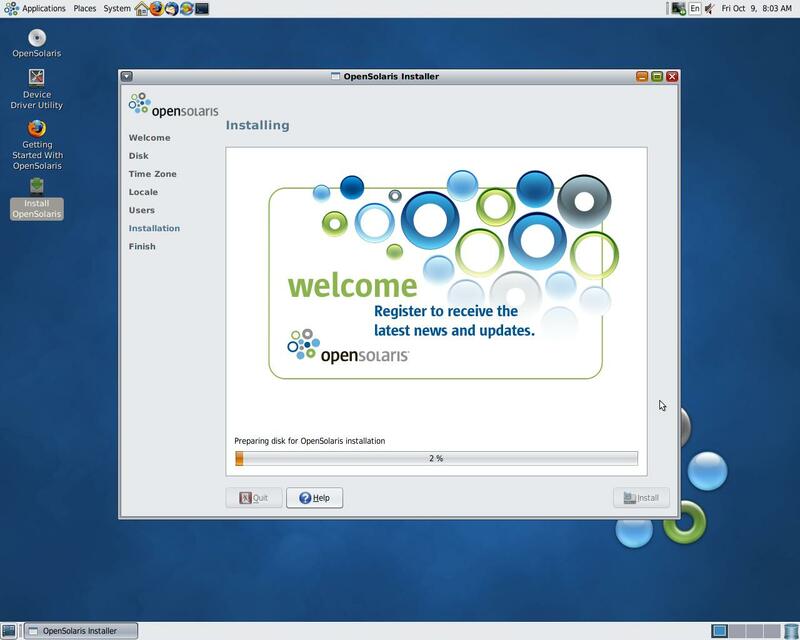 I’ll be building my Opensolaris server in VMWare, as it means I don’t have to go breaking any of my physical servers while I’m writing this howto. First thing I’ll do is set up some hardware which will hold the basic system. I’ll go with a single processor, 1Gb of RAM, and a single 8Gb hard disk for the operating system. Normally we’d have more, but for the purposes of this demonstration it’ll do. Next, I’ll add the Opensolaris ISO as the CD image, and fire it up. Enter your keyboard and language settings as required and the next thing you’ll see is the Solaris desktop. 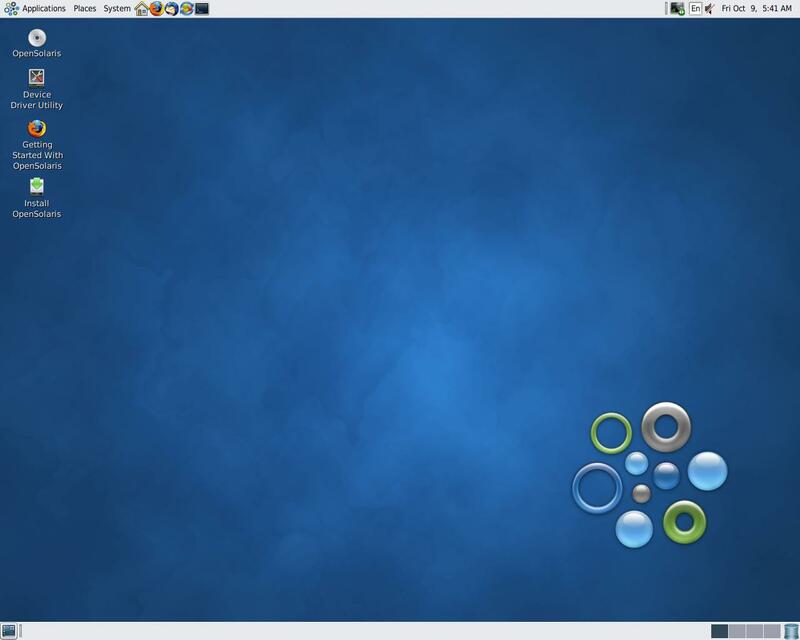 You’ll notice that it looks a heck of a lot like Ubuntu, Fedora and countless other Linux distributions, mainly because of the fact that it uses Gnome as its desktop environment the same as they do. But under the hood, things are a completely different kettle of fish. We’ll get to that shortly. Disk settings. I’m going to select to use the entire disk, as I don’t really want to mess about with partitioning disks just yet. On my production server, I installed to a single disk, then mirrored that disk to a second of the same size to provide some redundancy. Enter a root password and create an account for yourself. 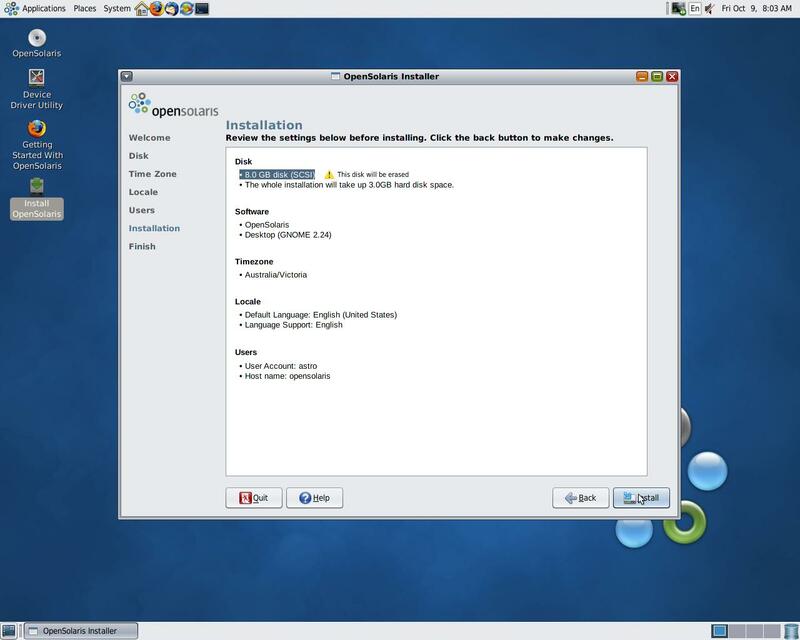 You can also set a hostname for your computer, but I’m going to be unimaginative and leave it as opensolaris. Confirm your settings, then press install to get started. After about ten minutes, your installation will finish and your computer will ask you to reboot into its new environment. Log in with the details you entered before and you’ll drop in to your new desktop. Fire up a terminal (it’s the black icon in the top bar) and we can start doing some poking around. Before we do, though, we need to become an administrator. Enter the pfexec su – to become root. Let’s look at what our disks are doing. Solaris gives you two very powerful tools to control your disk arrays: zpool and zfs. Zpool is for controlling a pool of disks, and zfs is for controlling the filesystems which live on your zpool. Excellent. We’ve got a pool named ‘rpool’ which is just under 8Gb in size, and is healthy. Which disks are there? Well, only one disk. Not too good for a NAS server, is it? Let’s shut down our machine and add some more disks to play with. I’m going to add four 10Gb virtual disks to my server, but if you were building a real machine you’d be opening up your server and plugging in your shiny new disks. Either way, when we reboot there’ll be a bunch of new storage media for us to play with. Once you’re done installing, fire up your server once again. Once you’re back in, open up a terminal and become root again by typing pfexec su -, then type format to show your new disks. Use control C to exit this section, as we don’t want to run the risk of damaging c8t0d0 – our system disk, which we know from the zpool status we did earlier. The new disks we just added are listed from c8t1d0 through to c8t4d0. Ok, so we don’t want to add these new disks to our existing system pool. We want to create an entirely new pool just for our NAS. So let’s do that, and add the new disks we’ve just added. By executing that command, we’ve said that we want to create a new pool of disks called ‘naspool’ which is in RAIDZ1 format. You could use RAIDZ2 if you wanted dual disk redundancy (up to 2 disks can fail before you need to start worrying), but for me, having single disk redundancy is fine. Excellent. 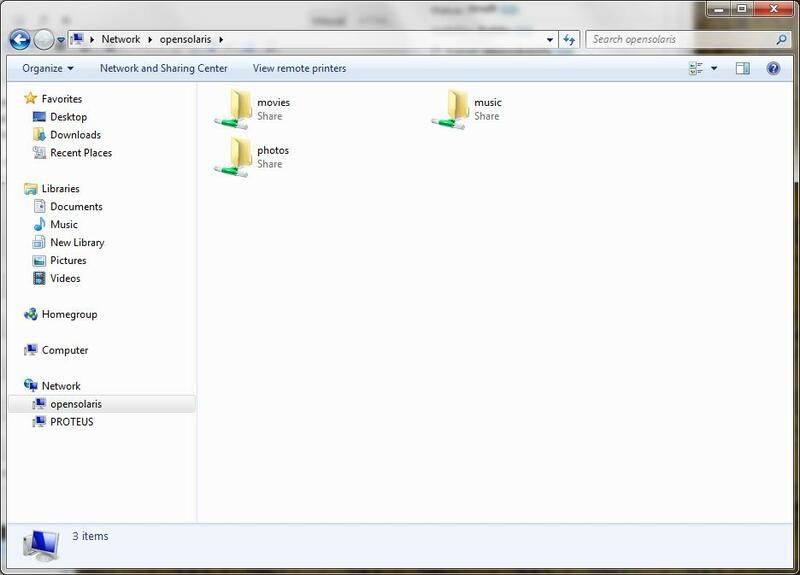 Three folders should be enough for now. What does that look like? Fantastic. We’ve now got about 30Gb of striped and paritied data to play with. On my production server it’s more like 3Tb, but that’s a story for another day. After joining WORKGROUP the smb service will be restarted automatically. Excellent. Our shares are all set up and ready to go. Let’s add them to Windows. 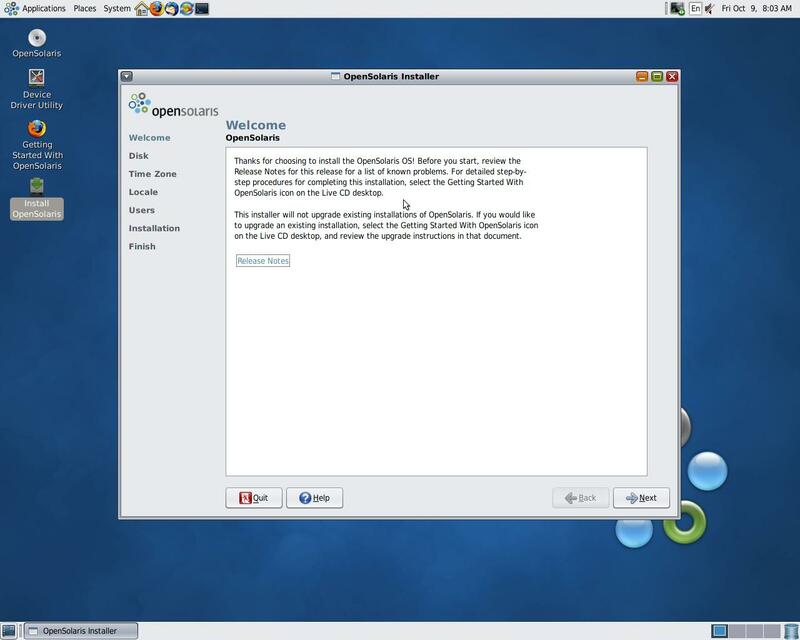 Open up an explorer window and type \\opensolaris, or whatever your computer name was. You can also use the IP address if you want to. And you should be able to copy all your files over with ease. So what’s next? Well, next week we’ll look at how you can expand your Opensolaris NAS with more or bigger disks to make a truly inexhaustable supply of storage awesome. ← Hmm. Time for a redesign?